Powers/Abilities: Benjy Matznik was a tall slim man with a long gray prehensile tail that he could deftly use to pick up items. (Astonishing I#18/4 (fb)) - Benjy Matznik's father died before he was born and his mother passed away a few days after giving birth, leaving his surly drunk grandmother to raise him, but she wasn't bothered by his slender tail. Matznik started early in a life of crime. As a teenager, he stopped being ashamed of his tail and soon learned to pick up small items, using this skill to pick pockets, steal from counters and even unlock windows. His reputation as a small-time thief grew over several years and he became known as the Cat Burglar, but always evaded capture with his tail hidden. (Astonishing I#18/4) - One day, he chanced upon a traveling circus and considered it easy pickings for pick-pocketing, stealing from handbags and the like. While surreptitiously stealing a man's wallet, Matznik was astounded to see a young woman called Tigrina on show with a furry tail. Believing there to be some kinship, he thought they would make a great crime duo and forced his way into Tigrina's dressing room after the show. Tigrina was disgusted with men treating her like a beautiful freak, but quietened down when Matznik showed her his tail and revealed himself to be the Cat Burglar. Matznik was shocked and frozen in fear when Tigrina suddenly grabbed his throat and savagely throttled him. His dying gasps came as she declared herself to be of the Cat People and that she considered him to be like a mouse. Comments: Created by an uncredited writer and Larry Woromay (artist). So was he a mutant (although he had his tail seemingly at birth), a mutate, a normal human but born with a tail, or were his parents likewise endowed with a tail? 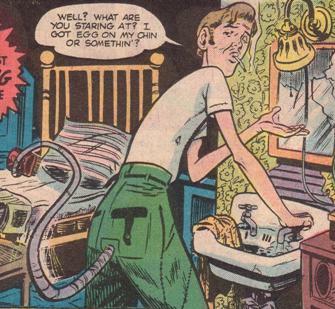 Perhaps there's a connection with the Were-Rats and he was similar to Sub-Mariner - a hybrid offspring from a human and Were-Rat. Tigrina's assertion that she was one of the Cat People (maybe those connected with Tigra?) may have been delusional, but I'll take her at her word. Of course, Cat People need not be a race; they may be a group like the Serpent Society with characters of similar animal traits/themes. This story was reprinted in Uncanny Tales I#8/3 (February, 1975), which is where the images are from. Tigrina was a member of the Cat People (and so clearly aware of her people) and formed part of a traveling circus that showcased unusual people and creatures. She disliked men who wanted to date her for her freakish appearance with a tail and initially thought Matznik was the same until she saw his tail. Seeing him to be like a mouse and declaring herself to be of the Cat People, she choked him easily to death, her tail flicking as she stood satisfied over his corpse.